This has always been a bit of a tricky subject, because knowledge and information are used interchangeably by so many people. Therefore, you will often find KM solutions even today which are essentially nothing more than information or document management systems, i.e. which handle data, information, or perhaps even explicit knowledge, but which do not touch the most essential part of KM - tacit knowledge. Below you can find an infographic of the main differences, with a short explanation below. Please keep in mind that IM in many ways is a useful tool for KM, in that information can help create and refine knowledge, but as a discipline it is a different one. As I showed in the previous sections, knowledge and information are actually quite different, as is tacit and explicit knowledge. 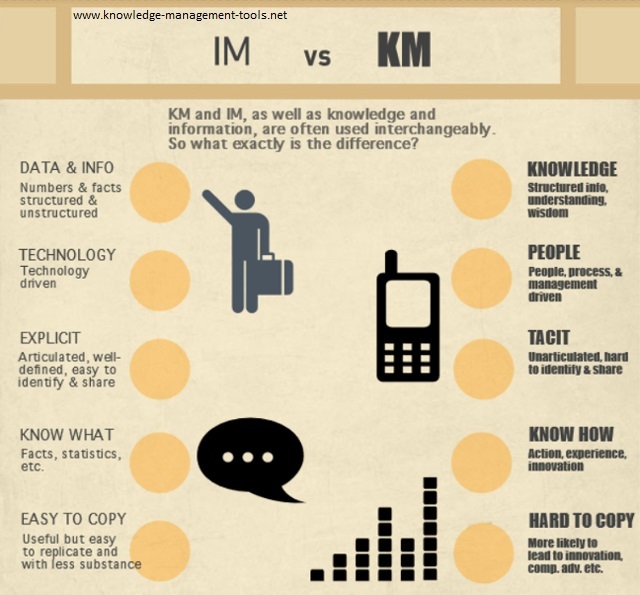 So, while information and data management are certainly very useful, particularly as information sources are growing at exponential rates and with the new focus on big data, it is not synonymous with KM. Deal with unstructured and structured facts and figures. Benefit greatly from technology, since the information being conveyed is already codified and in an easily transferrable form. Focus on organizing, analyzing, and retrieving - again due to the codified nature of the information. fact does not convey a course of action (e.g. sales of product x are up 25% last quarter). Is easy to copy - due to its codified and easily transferrable nature. Deal with both codified and uncodified knowledge. Uncodified knowledge - the most valuable type of knowledge - is found in the minds of practitioners and is unarticulated, context-based, and experience-based. Technology is extremely useful, but KM's focus is on people and processes. IT is great for transferring explicit, codified knowledge, but it's role in the transfer of deeper, internalized knowledge is more complex. Since this kind of knowledge is passed from person to person, through interaction, collaboration, mentoring, etc. and preferably in an unstructured environment, IT tools for KM have to support this function. They are therefore not merely passing on information, but also act as tools to bring people together, to enhance communication, to allow the storage and transfer of unstructured thoughts and notes, etc. Focus on locating, understanding, enabling, and encouraging - by creating environments, cultures, processes, etc. where knowledge is shared and created. Is hard to copy - at least regarding the tacit elements. The connection to experience and context makes tacit knowledge extremely difficult to copy. This is why universities cannot produce seasoned practitioners - there are some things (the most important things) that you simply cannot teach from a textbook (or other codified source of information/explicit knowledge). These are learnt in the field and understood on an intuitive level. You cannot easily copy or even understand this intuition without the right experience, context, etc. - and it is this intuition that represents the most valuable organizational knowledge.